Recommended Name: � the Venice or Venetian pattern. Cardmakers were known in Venice at least as early as the 1530s, but it is not yet clear exactly what designs were followed. The earliest claim to a pack with something of the present Venetian pattern lies with a Cavalier of Batons found in the old prison under the Doges' Palace, and now in the Museo Correr in Venice. It has turnover dotted edges and 'Marte' on the back. It is described as late 16th century. Possibly the next surviving pack, probably from the 17th century, was made in Venice by M. Ottavio 'Cartoler in Piazza San Marco tien insegna La Perleta', a style which has been dated 1660, and this was probably succeeded by a pack by Mo. Benetto, with the same address and sign, also with dotted turnover edges. On the surviving Aces of the former pack the feature of mottoes was employed although these specific sentences were not repeated on later packs. They read 'CHI COPPE HAVERA DINARI TROVERA' (Cups), and 'CHI BEN GIOCA DI SPADA VINCER SVOLE' (Swords). Probably close in date of manufacture came a pack by Mo. Marcho 'Cartoler al Ponte dei Angelo tien insegna La Turchina', but the turnover edges have no dots and there are mottoes on only two of the Aces ('ASSAI DINARI RICHISE' on the Ace of Coins). Traditional mottoes became established in the 18th century and, with minor variants in the spelling, read 'PER UN PUNTO MARTIN PERSE LA CAPA' (Cups); 'NON TI FIDAR DI ME SE IL CUOR TI MANCA' (Swords); 'NON VAL SAPER A CHI HA FORTUNA CONTRA' (Coins) and 'SE TI PERDI TUO DANNO' (Batons). The last single-figure examples of the pattern date from the mid-19th century. The double-headed packs still retain the full-length Aces (with mottoes) and many of the older features, such as the executioner holding a victim's head on the Jack of Swords. The Ace of Cups has two profiled heads on the Cup's stem; that of Swords had a crown and two cockerels. The King of Batons in later packs had the badge of 'TARVISIUM' at the centre. With the coming of tax stamps and makers' names being transferred to the Ace of Coins, the motto and central female figure are usually omitted. Interestingly the traditional mottoes are known on at least one example of the neighbouring Trentine pattern ([IPCS #37]). This pattern was used in the Veneto and Friuli regions with a 19th-century offshoot, the Trieste or Triestine pattern ([IPCS #36]) covering the remaining areas bordering on the northern Adriatic which were once held by Austria-Hungary. 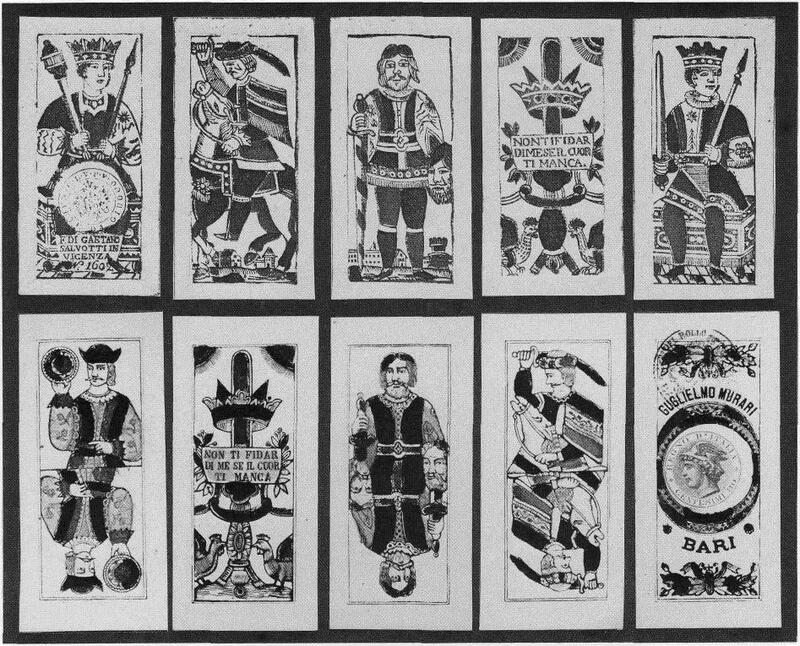 Any relationship with the more northern Trappola patterns has yet to be established, although the games played with these cards were known in Venice as early as 1540. 52 cards: 4 suits comprising King, Cavalier, Jack, 10-Ace. 40 cards: 4 suits comprising King, Cavalier, Jack, 7-Ace. Single-figure. Those mentioned above. Gio. Batta. Luchini of Venice, c.1805; Filippi, Rovereto, c.1830; Gaetano Salvotti, Vicenza c.1850, as well as some early anonymous makers. Double-headed. These include Gae. Salvotti, Vicenza, mid-19th century; Francesca Rind, Treviso, 2nd half 19th century; Francesco Presioso, Treviso, c.1875-1928; Nuovo Fabbrica La Fiducia, Trieste, last quarter, 19th century; Gugl. Murari, Bari, c.1885-1929; Lit. E. Passero, Udine, c.1900; Matteo Ambrosi, Vicenza, 1858; Compostella e Pinzon, Padua, 19th century; Gio. Batta. Codognato, Venice, early 19th century; Antonio Moro, Venice, c.1830; Lamperti, Milan, c.1865, c. Frizzo, Vicenza, c.1865, and many others. LE CARTE DA GIOCO A VENEZIA by Lucia Nadin Bassani, Venice, 1989. FANTI E DENARI on occasion of exhibition Fanti e Denari. Sei Secoli di Giochi d'azzardo a Venezia, Venice, 1989. ANTICHE CARTE ITALIANE DA TAROCCHI, Rome, 1961. THE GAME OF TAROT by Michael Dummett, London, 1980. THE CARY COLLECTION OF PLAYING CARDS by William Keller, Yale, 1981. A DESCRIPTIVE CATALOGUE OF PLAYING AND OTHER CARDS IN THE BRITISH MUSEUM by W.H. Willshire, London, 1876, and Amsterdam, 1976. CATALOGUE OF THE COLLECTION OF PLAYING CARDS BEQUEATHED... BY THE LATE LADY CHARLOTTE SCHREIBER by Freeman O'Donoghue, London, 1901. Single-headed (above) and double-headed versions of the pattern.